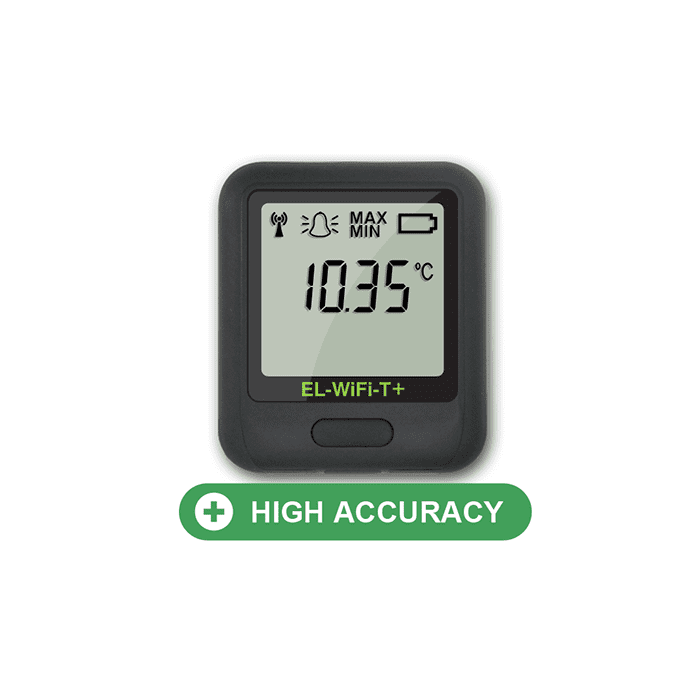 The Lascar EL-WiFi-T-Plus WiFi Temperature Data Logger with a high accuracy sensor measures the temperature of the environment in which the probe is situated, with an accuracy of +/- 0.1°C. Data is streamed wirelessly over any WiFi network and can be viewed on a PC using our free software package or on the EL-WiFi-Cloud*. During configuration, the sensor will search for an existing wireless network whilst physically connected to the PC. It can then be placed anywhere within range of the network. If the sensor temporarily loses connectivity with the network, it will log readings until it is able to communicate again with the PC application or cloud service (max 120 days at 10-second sample interval). Although the EL-WiFi sensors have an impressive range this can be increased by using WiFi extenders. The EL-WiFi-T+ is a low powered battery device. When configured using typical transmission periods (e.g. once every 5 minutes) the sensor will operate for over one year (at room temperature). The battery can then be recharged via a PC or USB +5V wall adapter using the USB lead provided or can be permanently powered by the USB wall adapter. The EL-WiFi-T-Plus WiFi Temperature Data Logger is a freestanding unit, however, it can be attached to a wall or vertical surface using the bracket and screws / sticky pad provided. Requires 802.11b compliant WiFi router/network. Compatible with Enterprise Networks from September 2013. The EL-WiFI loggers are not supplied with software, however the control software is downloadable, free-of-charge from the Lascar website. The software is compatible with Windows XP, Vista and 7 (including 64-bit operating systems). Note, the software is not compatible with Mac or Linux. Now you can communicate with your sensor on any smartphone, tablet or PC, anywhere in the world. Monitor conditions, change sensor settings and receive email alerts instantly. Visit www.easylogcloud.com to download WiFi sensor software onto your PC and sign up for a Cloud account.